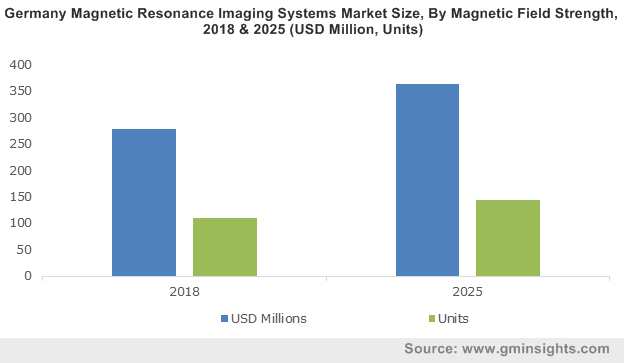 Magnetic Resonance Imaging (MRI) Systems Market size was about USD 5 billion in 2016, with growth forecast over 7% CAGR from 2017 to 2024. Magnetic resonance imaging (MRI) systems market is poised to exhibit lucrative growth over the forecast period. Growing elderly population base will serve as a high impact rendering factor as these individuals have a higher susceptibility towards degenerative spinal diseases. Increasing prevalence of chronic diseases especially in Asia Pacific region should fuel industry growth. Chronic diseases such as cancer, liver, heart and kidney disorders are increasing owing to lifestyle changes, lack of physical exercise and consumption of harmful substances such as tobacco. MRI scans are increasingly being used in the diagnosis of cancer as the technique is efficient in locating the cancer and helps doctors in understanding if it has spread. Growing public awareness regarding early disease diagnosis should further augment demand. An increasing number of people are opting for MRI scans for early detection of diseases as it enables them to better plan their long-term care and finances. MRI machines and related software are undergoing rapid technological advancements which will stimulate demand in near future. For instance, GE Healthcare launched Silent Scan technology which is useful particularly in reducing anxiety among pediatric and claustrophobic patients. Increasing number of road accidents should further propel industry growth as doctors generally advice MRI test in accident cases for detecting injuries and providing the required medical care. Road accidents victims commonly suffer from joint injuries of the neck and back involving the cervical disk or lumbar spine and brain related injuries. However, dearth of skilled professionals required for handling these machines hampers industry expansion as the machines are left underused. Technicians and radiographers are required for performing the diagnostic test and selecting appropriate imaging parameters for adjusting the system, viewing the images and maintaining their record. High cost of the equipment further impedes adoption. The cost of the system varies as per its imaging power. Depleting helium gas deposits pose as a serious problem for the industry impeding its growth. Closed MRI scanners held the largest revenue share in 2016. Closed configurations with higher field strengths permit faster scans and provider greater resolution and thinner slices which is very useful in viewing smaller anatomy parts. 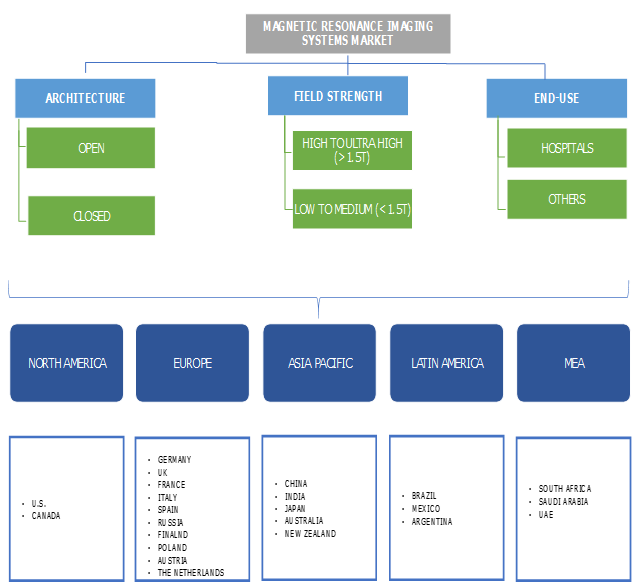 Open systems magnetic resonance imaging (MRI) systems market are poised to grow at a lucrative pace over the forecast years. Open configuration consists of two large, rounded, horizontal metal discs as poles of the magnet between which the individual is placed. Ability of this configuration to accommodate large sized patients will propel segment growth. Extremely claustrophobic patients who want an open environment prefer to use these machines. Furthermore, open configurations can also provide motion studies of the joints which cannot be performed under closed configurations. High to ultra-high machines dominated the magnetic resonance imaging (MRI) systems market in 2016. High field exams are obtained in approximately half the time as compared to low field. Benefit of reduced test time will propel adoption. Furthermore, these scanners restrict patient motion which is the greatest factor contributing to image degradation and thus provide images with enhanced quality. However, feeling of claustrophobia due to closed nature of these scanner impedes adoption to some extent. Low to medium scanner should witness lucrative growth over the forecast years as they permit access to patients for interventional procedures. Hospitals accounted for the largest share in 2016. Increasing influx of patients suffering from spinal cord damage, soft tissue injuries and disc protrusions requiring magnetic resonance tests will boost segment growth. U.S. magnetic resonance imaging (MRI) systems held significant revenue share in 2016. Increasing use of ultra-high MRI machines for conducting various researches will fuel growth. Increasing number of road accidents coupled with coverage provided through personal injury protection should further escalate demand. India magnetic resonance imaging (MRI) systems market presents a lucrative future opportunity owing to presence of large pool of elderly patients suffering from chronic disorders. MRI machines are being rapidly installed in big cities having large population of middle income people. Increasing public demand for availability of good healthcare facilities along with efforts being undertaken to modernize existing healthcare infrastructure should further stimulate demand. Some of the prominent industry participants include Koninklijke Philips N.V., Hitachi, GE Healthcare, Toshiba and Siemens. The industry players resort to various strategic initiatives such as partnerships, new product launch and collaboration for enhancing their industry position. For instance, in February 2016, Siemens launched Magnetom Vida, a high end 3T scanner with BioMatrix technology which addresses inherent physiological and anatomical differences among patients. Launch of the new product has broadened the company’s product portfolio. Magnetic resonance imaging systems are undergoing rapid evolution as many new clinical applications are being pioneered and investigated. The industry is consolidated in nature and witnesses moderate to high industrial rivalry. At present, the market has few well established players such as GE healthcare, Siemens and Philips which employ a highly skilled and experiences workforce. The industry players are engaged in rigorous research and development for developing better machines that enhance patient comfort. Firms are focusing on developing technology that requires considerably less amount of helium or functions on other alternatives. Hybrid systems are also being developed which make use of both PET and MRI techniques for enhancing molecular and system diagnosis. Latin America and Asia Pacific countries serve as a lucrative future opportunity owing to the ongoing expansion of healthcare infrastructure, increasing spending on healthcare and presence of large pool of geriatric and chronic disease patients. Increasing vehicular traffic and consequent collisions and accidents should further escalate demand for scans in near future.